Spring is NOW, a time for new beginnings, new growth, new intentions and manifestations. 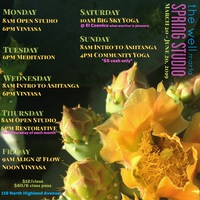 We support you with yoga, meditation and bodywork at The Well this Spring, now and beyond, at The Well. We are confident that you can find a class that suits your needs and is aligned with your level of practice. A set sequence of asanas (postures) linked together with deep rhythmic breathing and focused attention. In this class we explore the primary series, a challenging and invigorating sequence of postures that strengthen, tone, and cleanse the muscles, joints, and internal organs. The practice brings the mind and body into harmony and focus. During the class students of all levels will be guided in unison through the series. Variations for postures that prove challenging will be provided as necessary. The practice is defined by individual needs- the student works to his or her limitations and progresses at his or her own pace. This is a highly individualized practice in a group setting. All levels vinyasa flow class. Resident teachers rotate leading this class each Sunday of the month. $5 CASH ONLY. Students are invited to practice on their own within the nurturing environment of The Well and in the company of other liked-minded yogis. Students may sequence the postures as they prefer or follow the sequence specified by a yoga system of their choice. Whether the sequence chosen is based on Ashtanga, Iyengar, or another system, self-guided practice is the best way to learn the proper intensity and natural pace for your disposition. The memorization and repetition of a personal sequence helps bring the mind and body into harmony and creates a deep state of concentration. Open Studio runs from 8 am – 9 30 am. Please arrive no later than 8 30 am. Use as much or as little time as you need to complete your practice by or before 9:30am. This is a great opportunity for students taking Intro to Ashtanga to memorize the sequence and practice in the Mysore style. Although this session is not led, Pat will practice along-side the students and will be happy to answer questions and offer suggestions. A gradual and dynamic progression or a step-by-step approach that systematically and appropriately takes a student from one point and safely lands them at the next point, linking breath to movement. This class builds heat, endurance, flexibility, strength and concentration. Two 20 minute sits with a 5-minute walking meditation between sits, finished with an open discussion and dharma talk. Meditation practice is seeing what our mind is doing, where it is going, and returning to the visceral experience of reality in the present moment. With consistency, meditation can help us see our lives more clearly and function with more ease and benefit in the world. Please email nicolas.terry@gmail.com before your first sit. Relax, reboot, and reset in this restorative yoga class. This class focuses on restoring the mind, body and soul. Each curated pose is held for 3-5 minutes and the class is designed bring the mind and body to a sense of peace and calm. We will practice stillness and gentle movement, using props to allow passive stretching that enable you to walk out of class feeling refreshed and renewed. This practice focuses on alignment and mindful awareness as one moves from the deep core of physical body to build strength, balance and flexibility. Time on the floor and detailed alignment is combined with a gentle vinyasa flow. All levels Vinyasa on the outdoor stage at El Cosmico. Please check the online daily schedule under "BOOK NOW" for location changes – during inclement weather this will be indoors at The Well. And finally, a special retreat weekend, The Well Weekend, is coming right up ~ March 29-31. We still have some drop-in spots available in all of the sessions... Please reserve a spot if you are sure you want to attend, as we do anticipate it filling up. This is a weekend of Yoga with Taylor Matus of Indigo Studio in Fort Worth. Each session will be anchored with a meditative sit with our resident teacher, Nick Terry of Marfa. Sessions Friday March 29th at 6pm, Saturday March 30th @ 10am & 4pm, Sunday March 31st at 10am~ to sign up and see class details, visit www.schedulicity.com/scheduling/TWWBDA/workshops.